Tattoo lettering is used on tattoos to inscribe messages. Messages might use white ink to create a private message, or the bold, block lettering common in gang-style tattoos. Tattoo lettering can stand alone on the body or be part of the larger design. 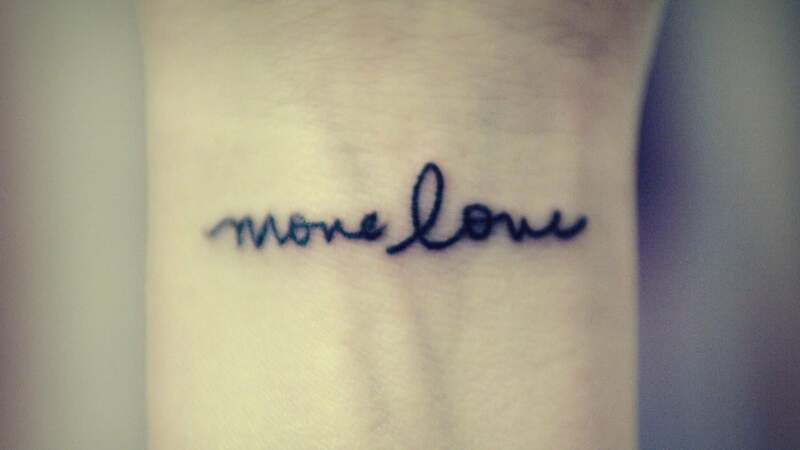 Some people like to get small tattoos on their fingers with beautiful writing that indicates a subtle message. Singer Rihanna made this fashion popular by getting "Shhh" tattooed on her pointer finger. Others get lettering in white, brown or black on their inner wrist, usually facing in so the wearer can read it. Some people elect to have entire poems or song lyrics tattooed onto their bodies. These types of tattoos take up a large area of skin, so the back and the ribs are common locations for large blocks of text. Tattoo lettering is also incorporated with pictorial designs. Lettering needs to be separate from the picture, otherwise the words cannot be read. Therefore, lettering is often placed outside the picture or in a banner going across the picture. Tattoo lettering is very popular within the gang culture to indicate affiliation. Typically, gangster tattoos are done in a block-style font or a heavy cursive-style font. Typical locations for tattoo lettering are across the top of the back, on the fingers or across the collar area, though gangster rapper Tupac Shakur made the stomach a popular area for tattoo lettering.